Rocks on the Island of Newfoundland are divided into three zones - Western, Central and Eastern. The Western Zone has been part of North America for at least the last billion years (1000 million), but the other two zones are relative newcomers. The bringing together of ancient oceans and continents has given Newfoundland three geological zones: the Western, Central and Eastern zones. Each of these zones has distinct rock types and geological histories. About 600 million years ago, North America was part of a much larger continent. Then this continent broke apart. A mid-ocean ridge developed along the break and the Iapetus Ocean began to open. By the Middle Cambrian (540 million years ago), the Western Zone lay on the eastern edge of ancient North America, a continent we now call Laurentia. 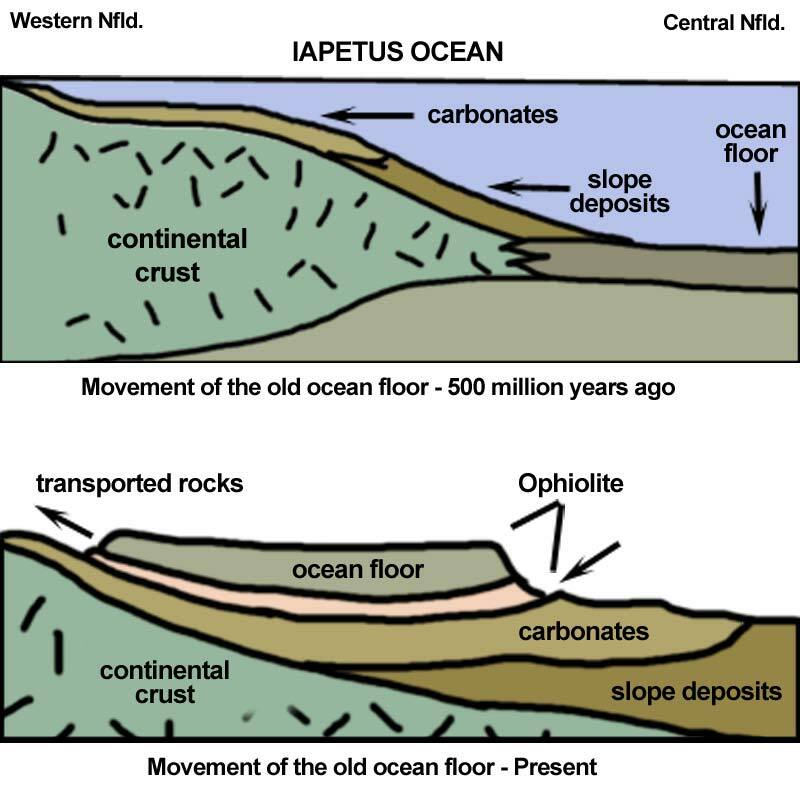 Opening of the Iapetus Ocean and the formation of a mid-ocean ridge 540 million years ago during the Middle Cambrian period. From Stephen Colman-Sadd and Susan A. Scott, Newfoundland and Labrador: Traveller's Guide to the Geology (St. John's: Government of Newfoundland and Labrador, 1994). Then convection currents shifted and subduction began. By Early Ordovician time (about 490 million years ago), volcanic island arcs had grown above the subduction zones, as the floor of the Iapetus Ocean sank back into the mantle. Today, the remains of these island arcs are preserved in the volcanic and intrusive rocks of the Central Zone. Closing of the Iapetus Ocean and collision of ancient continents which took place 490 million years ago in the Early Ordovician. Subduction of the Iapetus Ocean floor slowly pulled Laurentia toward another continent, Gondwana, which lay to the east. As the continents converged, pieces of ocean crust and the underlying mantle were pushed onto the continental margin of Laurentia about 470 million years ago. The west coast of Newfoundland was the continental margin of the Iapetus Ocean. When the Iapetus Ocean closed, slope deposits and giant slabs of the old ocean floor (ophiolite) were transported westward across the old continental margin. From A. B. Ryan, Newfoundland Journal of Geological Education, Vol. 7, No. 2, 1983. Adapted by Duleepa Wijayawardhana. 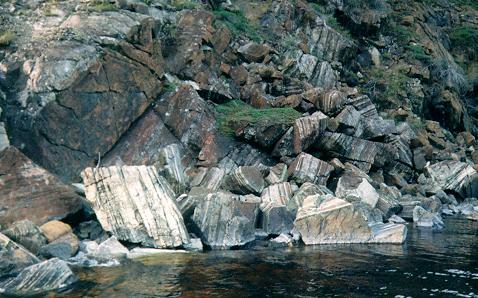 These huge slabs of ocean floor (up to 40 x 10 km) are preserved in the mountains of western Newfoundland as a rock sequence called ophiolite. Table Mountain in Gros Morne National Park and Blow-Me-Down Mountain near Corner Brook are examples. Photo courtesy of Trevor Bell, © 1998. By the Early Devonian (410 million years ago), Laurentia and Gondwana had collided, forming a huge, new continent. Across the middle of the continent, where the Iapetus Ocean had once been, there was a mountain range, and halfway along this lay what is now Newfoundland. 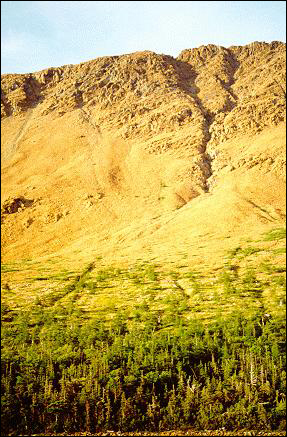 Over time, these mountains were gradually eroded by wind and rain. By the Carboniferous (360 million years ago), Newfoundland was once again fairly low-lying and swampy valleys and lakes on the west coast were filling with sand, mud, and plant debris. These are now preserved as sandstone, shale and coal, respectively. At the same time, parts of the sea were drying up, leaving evaporite rocks (salt and gypsum) behind. Hills underlain by white gypsum near Flat Bay, western Newfoundland. 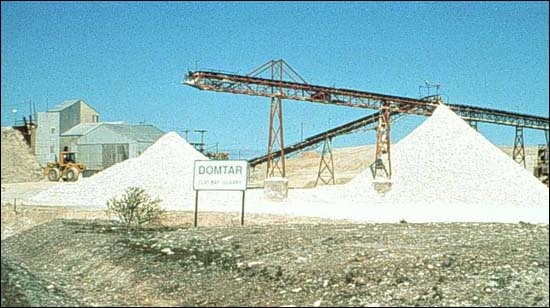 Gypsum is a soft, white mineral consisting mainly of calcium sulphate formed in hot climates during the evaporation of sea water. From Geological Survey of Newfoundland and Labrador - "Geology and Geological Features - Mineralization" and "Aspects of Mining in Newfoundland and Labrador: Production." https://www.gov.nl.ca/mines&en/geosurvey/. Courtesy of David Liverman, Government of Newfoundland and Labrador. 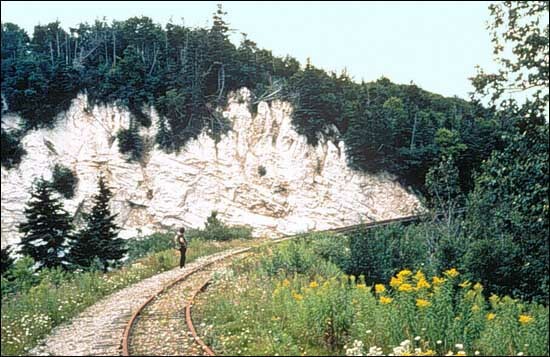 Gypsum from the Flat Bay deposit in western Newfoundland was used in the manufacturing of gyproc wallboard and cement in Corner Brook and was also exported to the United States. The continents stayed welded together until Early Jurassic time, 200 million years ago. Then they broke apart to form the present Atlantic Ocean, which continues to open today. But the break did not occur exactly along the line of the old Iapetus Ocean. In North America, it lay just to the east of it, leaving fragments of Gondwana still attached to Laurentia. The Eastern Zone of Newfoundland is one of these fragments. Others include Nova Scotia, and parts of New Brunswick and the northeastern United States. The southern half of the mountain range that marked the line of the Iapetus Ocean now forms the Appalachian Mountains of eastern North America, running from Alabama to Newfoundland. The northern half is to be found across the Atlantic Ocean in Scotland and Scandinavia. Gondwana, minus the Eastern Zone and the other pieces it left behind in North America, has broken apart to form Africa, South America, India, Australia and Antarctica. For other related articles view the Landscape section of the Natural Environment Table of Contents.